We’d love your help. Let us know what’s wrong with this preview of Vampyre by Margaret Wild. Picture books with themes suitable for older children approx.10+ yrs. Strong themes about being who you want to be and moral choice. To ask other readers questions about Vampyre, please sign up. 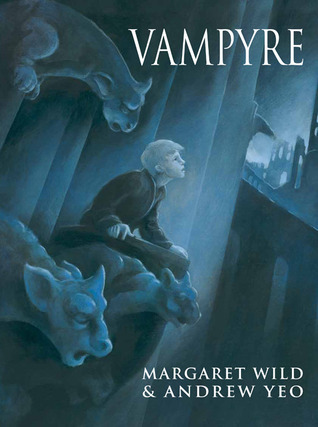 Vampyre by Margaret Wild is a children's picture book about a boy who just wants to be himself. I love Margaret Wild. She's undoubtedly one of my favorite children's authors, so when I saw this scary looking children's storybook, I had to grab it. The story is told in first person and the boy has basically been born a vampire and isn't accepting of it. He has to make a choice. This book is very creepy with dark images and can really pack a powerful punch. The boy deals with being rejected because he wants to be something else. The reader is left to contemplate about what you can do when you don't feel like you belong, and how you can express yourself when what others want for you isn't your dream. You long for a different direction-a different life. 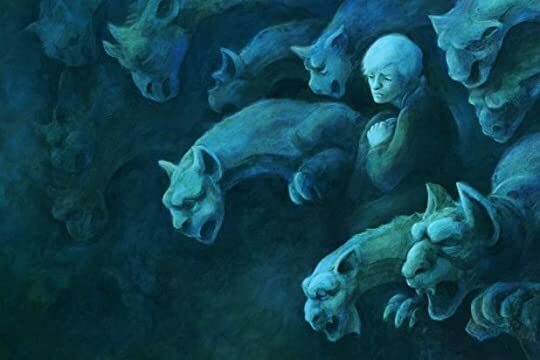 I was really surprised at how dark this story was and it's probably best for older children grade 7 and up. It's also a super expensive book and hard to find. I had to choose a picture book for an English Visual Literacy assignment and I have to say I made a fantastic random decision to pick Vampyre. I actually enjoyed reading it, even if it took me less than 5 minutes. The artwork and everything really got into me. It left some sort of impression, though I can’t exactly say what. It’s pretty dark and sad. I’m more surprised this is a children’s picture book. It’s short story is I had to choose a picture book for an English Visual Literacy assignment and I have to say I made a fantastic random decision to pick Vampyre. I actually enjoyed reading it, even if it took me less than 5 minutes. The artwork and everything really got into me. It left some sort of impression, though I can’t exactly say what. It’s pretty dark and sad. I’m more surprised this is a children’s picture book. It’s short story is about a boy, struggling to find his sense of belonging and connectedness when he’s different from everyone else, including his family. He wants to deny his identity of not being human but he can’t and it’s torturing him. I don’t think young children would have understood the message it sends. The meaning is hidden deep between the words and the images despite its stunning importance. Fabulous fabulous book. A surprise from Margaret Wild, in that this is a book suitable more for older children. This is a story about a young vampire who realises he is considered a monster to all other living things, and with all his heart, and against the expectation and beliefs of his family, he refuses to accept his destiny. With strength and determination he sets off to find another life for himself, a move which could cost him his life. Lyn is a judge for the Aurealis Awards. This review is the personal opinion of Lyn herself, and does not necessarily reflect the opinion of any judging panel, the judging coordinator or the Aurealis Awards management team. I will be reviewing and rating this once the AAs are announced. I've been reading Margret Wilde's book since I was little and I always enjoyed them. I found this at the Lifeline Booksale today and, although I love Wild's books was very disappointed in it. I left it there but have regretted it since. While it did not originally appeal to me, the story has stayed with me and my understanding of it has developed through the day. It is dark but it is a story of being who you want to be. I do hope it went to a good home.